When a call goes out for funding to find a cure, survivors give generously- but were often wistful that more wasn’t been done to help those struggling to survive. But now it’s official – research funding is to be allocated for research into these ‘Cinderella’ side effects. These were top 10 research prortes announced at the recent National Cancer Research Institute Conference. This came out as a result of a survey back in April inviting respondents to rank their top questions for research. 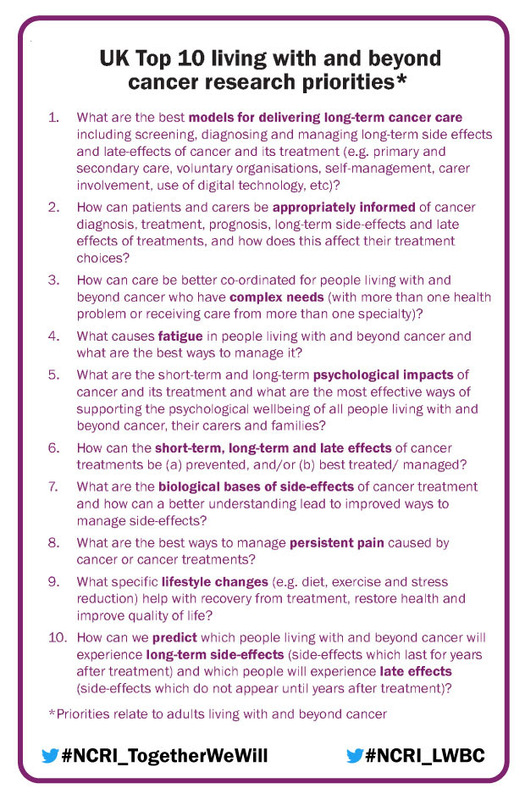 These were discussed at a workshop with patients, carers and health and social care professionals in June to decide on the definitive “Top 10”. As NCRI Consumer Forum Chair, Richard Stephens,said “there were tears, there were heated discussions, but in the end, we have 10 questions of importance to a large number of people living with and beyond cancer”. With top research priorities clearly defined they can now embark on the next stage of encouraging collaboration and accelerating efforts into plugging the gap in this area of cancer research. NCRI say “we are now focused on working with our partner organisations, other funders, researchers and the NHS to turn these priorities into research and patient benefit. You can help too – share the UK Top 10 Living With and Beyond Cancer research priorities with your local networks, communities, organisations, colleagues, family and friends. LWBC website includes a helpful ‘Publications & Dissemination’ section with tools to help you spread the word (blogs, video, top 10 flyer/download, press release, images, social media and more to follow). lwbc@ncri.org.uk. Copyright © 2018 National Cancer Research Institute, All rights reserved. You are receiving this email because you have signed up to the NCRI living with and beyond cancer mailing list.